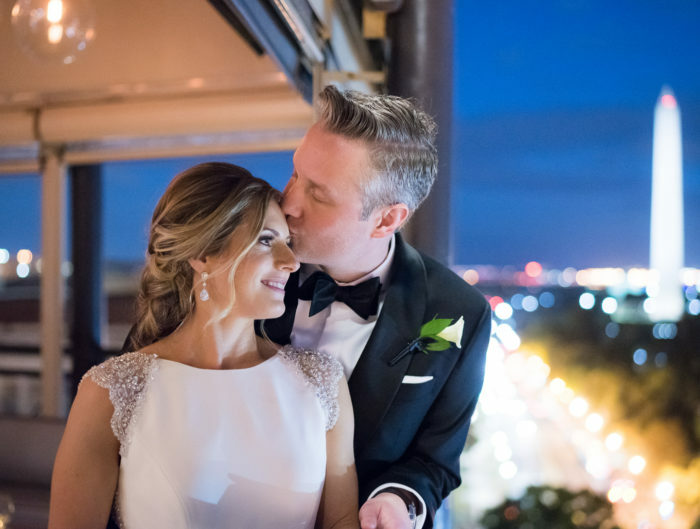 Snuggle up this morning DMV wedding lovers, because we are going back to winter just for a brief moment today, but, only because Ann and Matt’s wedding in Old Town is just so perfect! 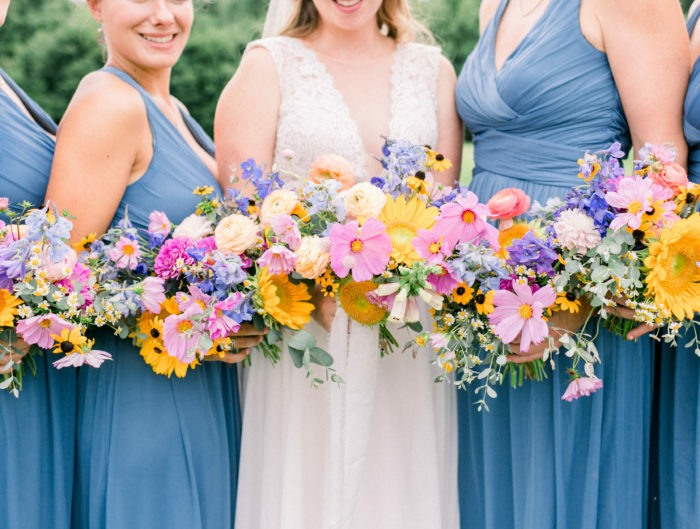 Ann and Matt were married in Virginia during a wedding ceremony full of winter wedding details, cozy knits, baby’s breath, pinecones, and the beautiful colors of white, ivory, green and grey. 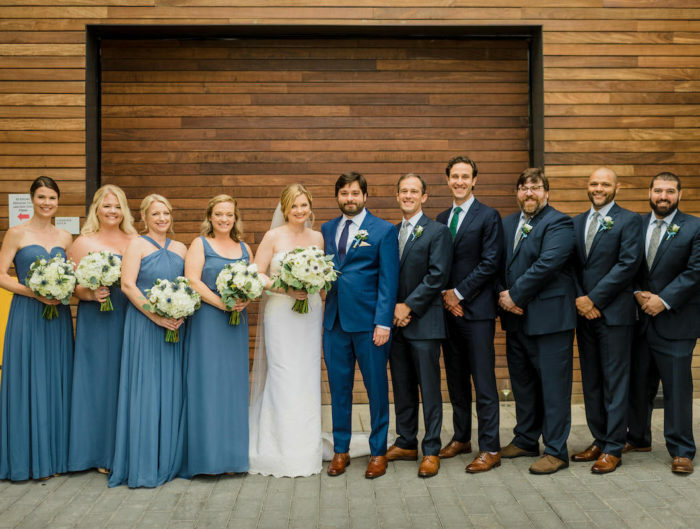 The pair wed indoors at the Torpedo Factory Art Center, a place selected in part because of its great location for their out-of-town guests and also for the ease of hosting their wedding ceremony and reception in the same spot. The bride was beautiful on her wedding day, the groom, incredibly dapper, but it might have been their four-legged friend who stole the show in cuteness – even their pup got dressed up for the big day! Thanks to k. thompson photography for sharing their wonderful wedding photos with us! From Ann: Matt and I dated for a very long time and lived together for several years before we got engaged. We also very seriously considered eloping at one point. When we decided to have a wedding, I wanted it to be personal to us and our friends and family and reflect something special between us. By spending so many years together, we had already really made a lot of commitments to each other and had known for long before we got engaged that we wanted to spend our lives together. Our wedding was a way to express these commitments and what they really meant to us on a personal level and share them with our family and friends. I had 11 bridesmaids, which sounds crazy, but I would not have had it any other way – I feel incredibly lucky to have so many special women in my life! So, I chose a color palate on Weddington Way and then gave them a ton of choices for dresses including different styles, materials and shades. I hope that they liked this freedom to choose a dress that worked for them personally, and I think the different dresses looked great together. Once they all picked their dresses, I picked out different, but coordinating, gold and while jewelry for each of them based on their personal tastes and the dress they selected. I also painted green and gold jewelry boxes to give the jewelry to bridesmaid before the wedding. Matt asked his groomsmen to wear a grey suit, which most of them already had, black shoes and a blue shirt. Then he picked out different, but coordinating, green ties for them based on their personal tastes. We wrote our wedding ceremony on our own based on a lot of advice and materials from our officiant, as well as our own research. I really loved learning about wedding traditions and writing the perfect wedding ceremony for us. From the beginning, I wanted every word that was said during our wedding ceremony to mean something to us and to our family and friends. I never felt the need to abide by a specific tradition. We included a number of readings and blessings that talked about love, friendship and life priorities. When we met with our officiant for the first time, we told him that our family and friends were very important to us and that we would like to include them in our wedding ceremony somehow. He gave us a few suggestions and we ultimately decided to say our vows while holding an oathing stone and while everyone else held blessing stones. The idea is that everyone says a silent intention for us while holding the blessing stone and then leaves the blessing stones for us in a basket that we keep in our home as a lifelong symbol of their presence at our wedding and intentions for us. We also took it a step further and provided pens for guests to leave a message for us on their oathing stone. Matt and I personalized our “traditional” vows and then each wrote our own personal message to say after exchanging vows. It was amazing how much our messages went together even though we did not discuss them at all before the ceremony! After writing our wedding ceremony, I used Adobe Publisher to create the inner pages of our ceremony program with the text of all of our readings and blessings (Mayla Studios designed the program covers to match the rest of our day of paper). Then Matt’s aunt and sister drew beautiful sketches to also include on the inner pages of the program. Ceremony programs always seem like something that is not completely necessary so when we decided to do them, I wanted them to be something very personal and special. Hopefully the artwork, which was one of the best gifts that they could have given us, accomplished this (it definitely did for me and Matt). Matt’s sister also did the chalkboard sign that greeted our guests when they arrived to our wedding. I will also never forget how all my friends and family were there for me every second of the wedding day, making sure I had everything I needed and more. We were able to include so many people, even our baby niece and our beloved dog, into our wedding, and I am so grateful that they were all there with us. Congratulations to Ann and Matt! Thank you for sharing your beautiful winter wedding ceremony with us! Stay tuned to check out their pinecone-clad green and white wedding reception! Beautiful wedding! I just wondered where you rented the backdrop for the ceremony at the Torpedo Factory?